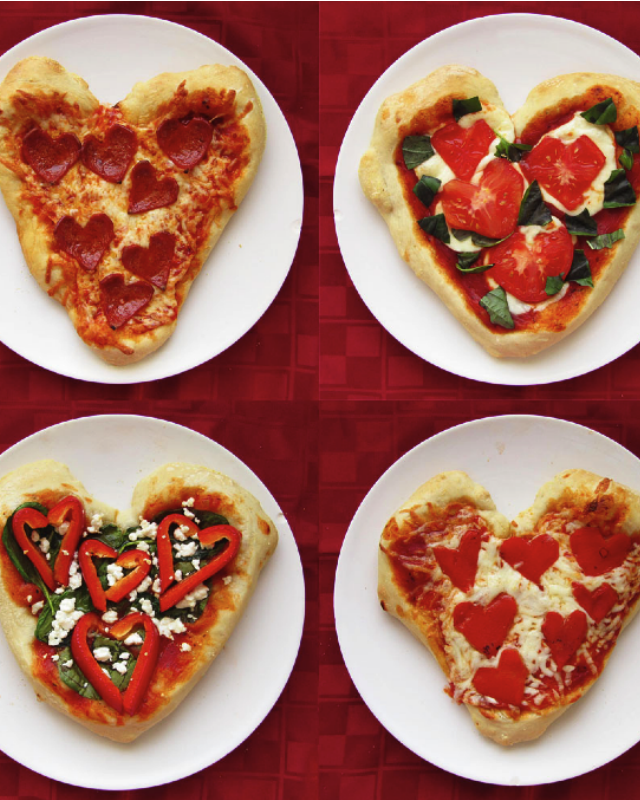 This V-Day, it's time for us to come clean about our one true love: pizza. Who needs a boo when you can have cheesy, saucy goodness all to yourself? The bottom line—we're saying see-ya to roses and chocolates this weekend and going all in on these adorable DIY snacks from Once Upon A Cutting Board. They're *almost* too cute to eat...but who are we kidding? We'll probably scarf down all four. 1. While preheating your oven to 450 ̊ F, use your hands to divide your pizza dough into 4 equal balls. 2. Roll out and spread each piece into the shape of a heart. Fold the edges and plump them up to give your pizza a nice crust. Depending on your preference, rolling the dough out thinner will give you are crispy thin crust. If indulging in a thick and flaky crust is more your style, ensure that the dough around the edges are a bit thicker. 3. Top your dough with tomato sauce and generously sprinkle on your favorite cheeses and additional toppings. 4. Place two individual pizzas on a single pizza stone and bake for 30 minutes or until the crust is golden brown. What are your favorite V-Day treats, GL girls? Let us know below!